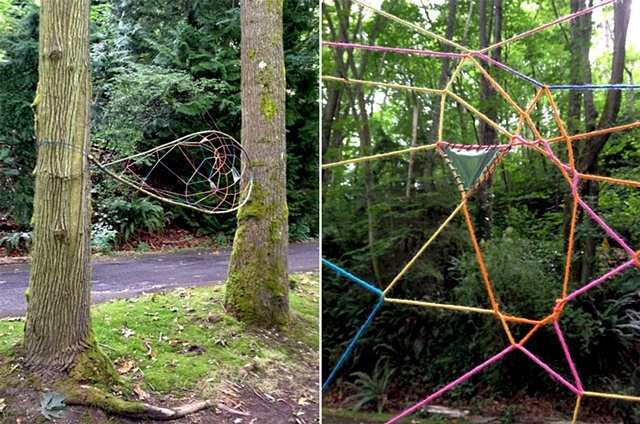 Second installation and detail view of piece at Carkeek Park in Seattle. Artwork is part of "Rootbound: Heaven and Earth IV" and will be on display through October of 2012 and is free and open to the public. Show is managed by Center on Contemporary Art Seattle, with support provided by the Carkeek Park Advisory Council, and Seattle Parks and Recreation. After an initial round of vandalism and theft of works at the park, the dream catchers from my initial installation went missing. In response, I put this piece up as a second phase of the work. The "teardrop" shape is considered the Cherokee style of dream catcher versus the traditional round form originating with the Ojibwe. The shape supposedly sprung from the forced migration historically known as the Trail of Tears when there was not enough time while traveling to create a round frame. Hung between two trees near the original installation site, the uninstalled piece is approximately 37" x 108". It is made from a bent maple branch, multicolored yarn, and five hand-stitched polypropelene patches.